A set of hammocks and pillow/blankets (double and single) slaved to Jonesi's bed blanket. A set of hammocks and pillow/blankets (double and single) slaved to Maxis bedding. 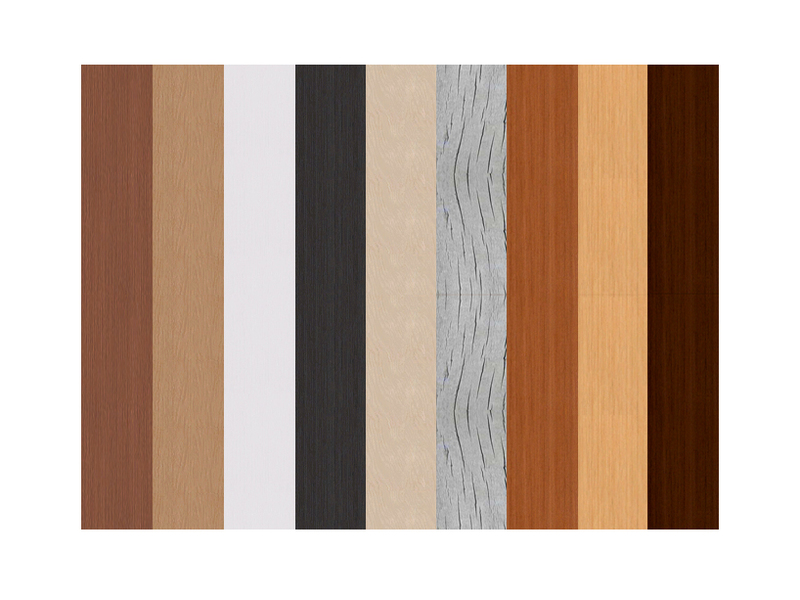 26 frame recolors for both sets of hammocks. The single frame of each hammock set is slaved to the double frame of that set. The pillow/blanket meshes are shiftable (if you can shift objects) and no cheats are needed to place them. 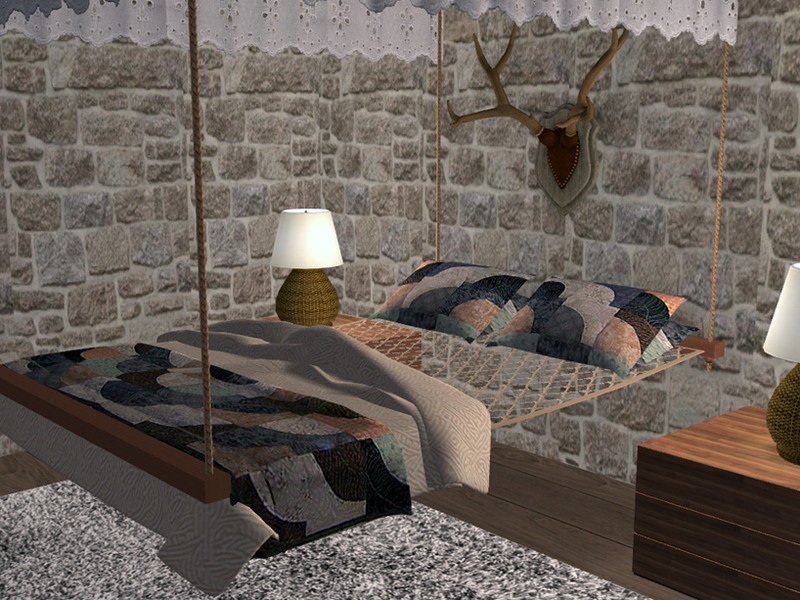 The pillow/blanket meshes were made for the hammocks but will work on Maxis and custom beds too. Since the meshes were made to be used outdoors (but they can certainly be used indoors too!) they are all visible from neighborhood view. There are 26 frame recolors but they're not *different* textures. 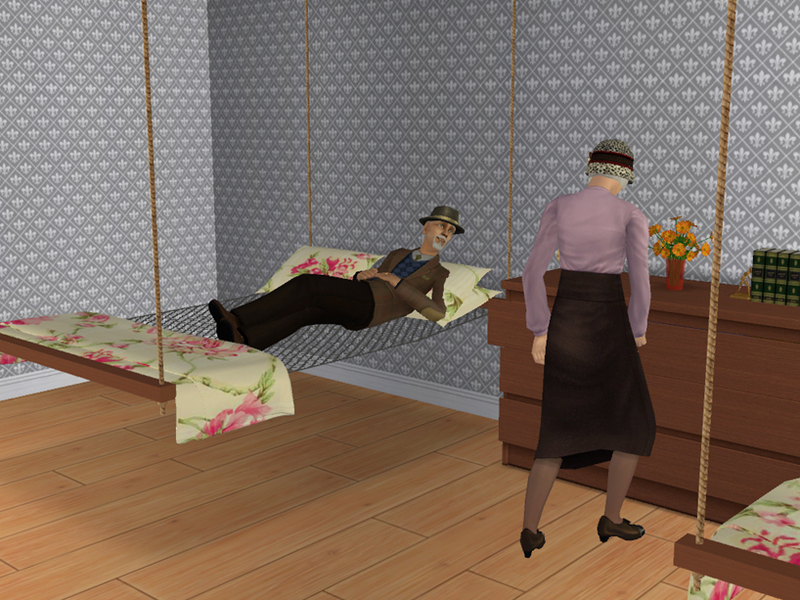 There are 3 versions of each texture: One will show the hammock suspended from the ceiling with a large wooden top frame (Default - 8); One will show the hammock suspended from the ceiling by just the ropes (DefaultB - 8B); One will show the hammock sitting on a frame on the ground (DefaultC - 8C). See screenshots! The hammocks were cloned from beds but DO NOT have all the bed functions. Sims can.not sleep, woohoo (or try for baby), jump on, "tuck in" or make the "beds". They CAN relax, daydream, read, cuddle, kiss and make out. The pillow/blanket meshes WILL NOT work with Lamare's bed deco mods . What I mean by that is that they won't disappear/reappear if you have any of Lamare's bed deco mods in your download folder. This is because the hammocks do not have the "make bed" function so the pillow/blankets would disappear when sims relax but not reappear when they get back up. To get around that issue I offset the pillow/blanket meshes by 1 tile, which means that they will stay on the hammocks when sims relax. (The blanket mesh is actually far enough down that it doesn't really get in the way anyway.) It's also important to note that the pillow/blanket meshes footprint being offset by 1 tile does not interfere with sims using anything placed in the same area - like a dresser - sims will still be able to use it. See screenshots! 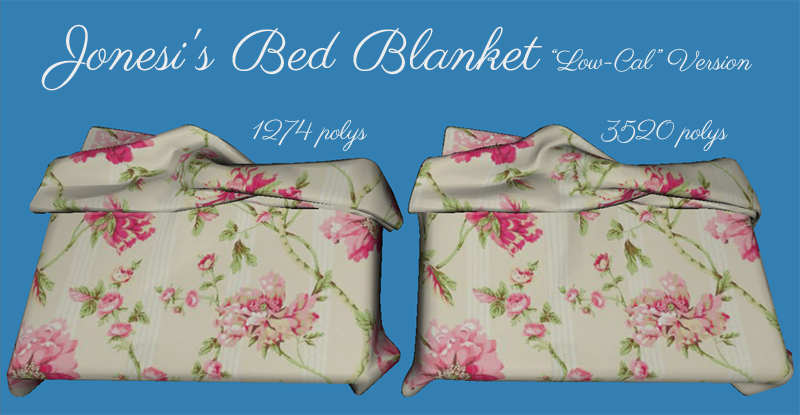 A reduced polycount version of Jonesi's bed blanket. The old polycount (3520) is high enough that there are people who've resisted downloading it. The new polycount of 1274 is reasonable enough that people can download it without worrying about the polycount. Please note that I have not reduced the polycount of any of the other blankets that are slaved to it - I don't use them often enough and you only need the original blanket to be able to use any of the many, many other objects slaved to the blanket and the many, many, many recolors available. 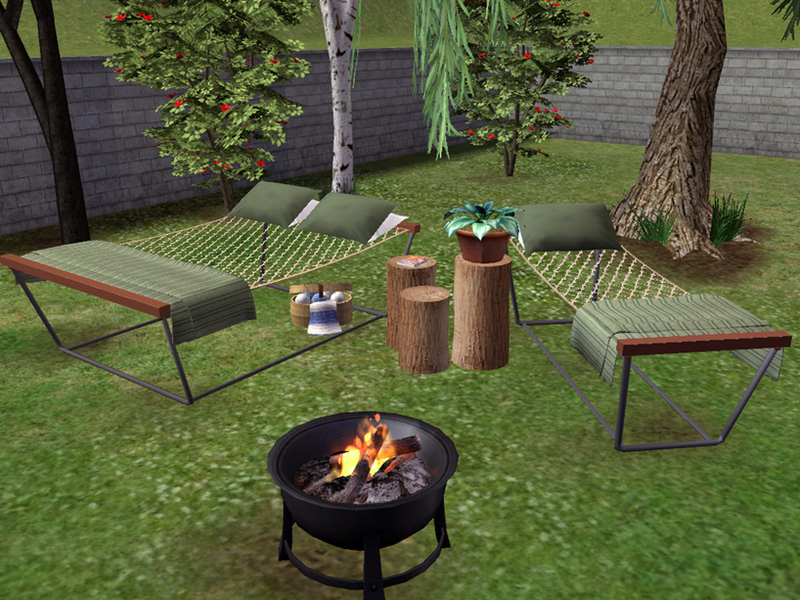 Hammocks can be found in Seating>Beds for 700 and 1200 Simoleons; Pillow/blankets can be found in Deco>Misc for 65 and 75 Simoleons; Jonesi's bed blanket can be found in Deco>Misc for 150 Simoleons. One last little note (sorry!) - Sims will clip through the pillows of the pillow/blanket meshes a little bit when relaxing. No real big issue or problem there, just thought you'd all like to know! Hope your sims enjoy relaxing in the fresh air on their new hammocks! 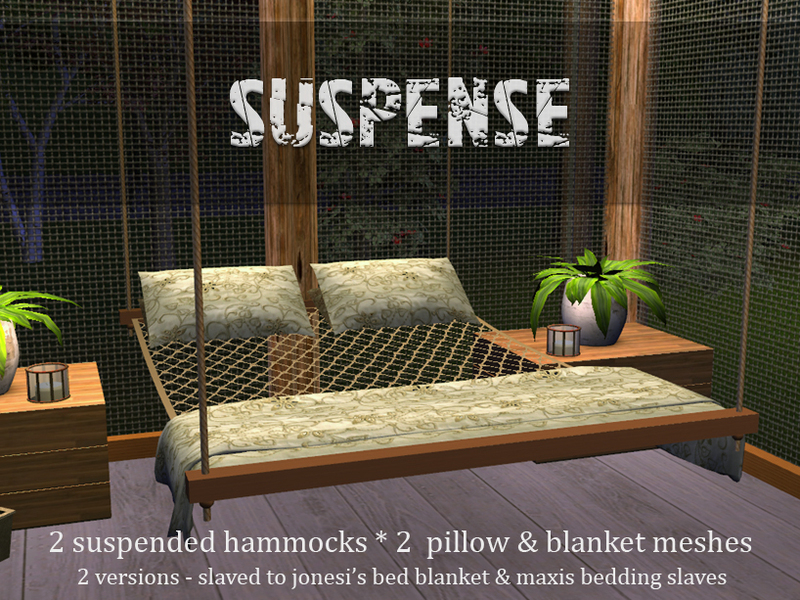 MLC-Suspense-MaxisBeddingSlaved.rar | Description: Set slaved to Maxis bedding. MLC-Suspense-JonesiBedBlanketSlaved.rar | Description: Set slaved to Jonesi&#039;s bed blanket.